Thank you both again for the great job you did Emme-proofing the house. We really appreciate all the time & effort & of course ingenuity you put in. Thanks for handling all of our “special requests”. J We feel confident now in the baby safety of our home. 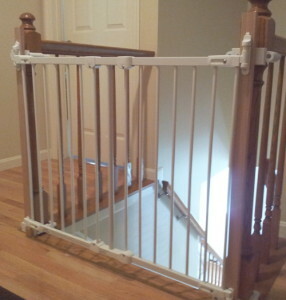 Thank you for all of the baby proofing! You both saved us so much time. 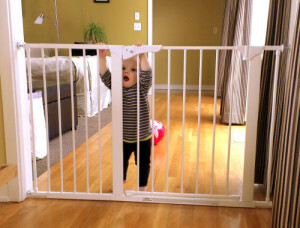 We appreciate the extra time and energy spent keeping our little ones safe (1 year old twins and big sister). It was a tremendous help and well worth it! 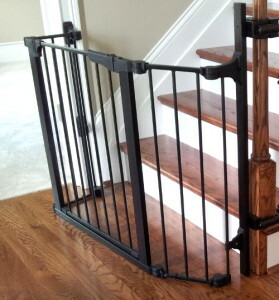 This extra large gate is to keep a very large dog in the kitchen area away from the carpet and the baby. 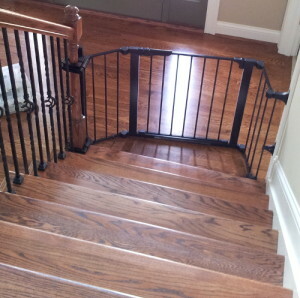 Custom gate placed at the bottom of the stairs as to not block the entrance to the study or to interfere with the front door opposite the stairway. The hardware attaching the gate was custom painted to blend with the banister and the railings.